AllPosters, online at AllPosters.com, is the online destination for posters, frames, art, and photography. 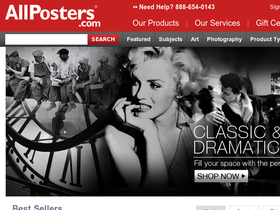 AllPosters sells more than one million images including posters featuring famous athletes, singers, and movie stars. AllPosters also carries wall murals, wall signs, wall decals, wall tapestries, giant posters, door posters, and fine art. You can also find vintage art, pop art, photographic prints, posters featuring famous quotes, canvas art, and limited editions at AllPosters. Some of the artists AllPosters carries are: Andy Warhol, Norman Rockwell, Salvador Dali, Pablo Picasso, Vincent van Gogh, and Ansel Adams. RetailSteal.com has the best AllPosters coupon codes, AllPosters discounts, AllPosters coupons, and AllPosters promo codes. Shipping and handling rates at AllPosters depend on the price of your purchase and your shipping destination. See website for full details. Exclusions may apply. Shop at AllPosters and enjoy 35% savings on all orders. Click here for code. Shop at AllPosters and enjoy 30% savings on all orders. Click here for code. Shop at AllPosters and enjoy 25% savings on your order. Click here for code. Save up to 50% on posters in clearance at AllPosters.com. Click to shop and save. Shop at AllPosters and enjoy 50% savings on select canvas art. Click here to shop. At AllPosters.com find a huge selection of best sellers starting at just $2.98. Click link to start shopping. Shop at allposters.com and get framed posters starting at just $39.99. Click here to shop. Sign up for an email subscription at allposters.com and get 35% off your next purchase. Click here to get started.